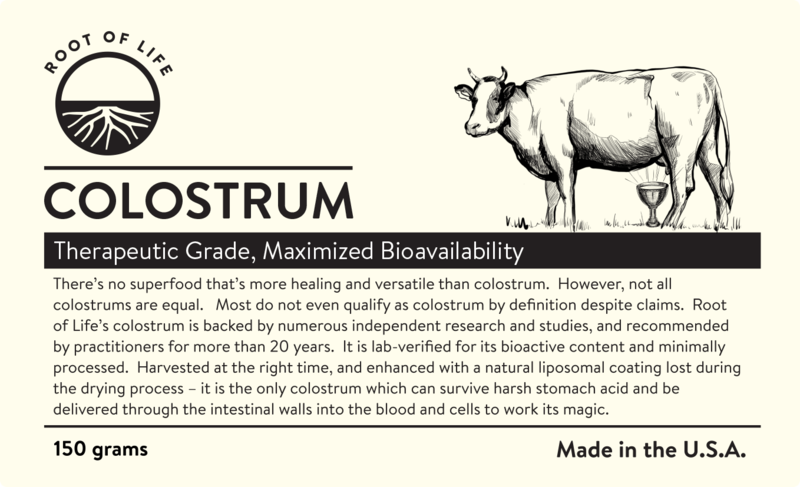 Our enhanced-delivery, therapeutic grade colostrum comes from USDA Grade A dairies from cows who are treated with respect, free to roam in the outdoors and grass-fed, and are of the rarer A2 variety – the ones that do not contain the mutated Casein that causes a whole host of problems. 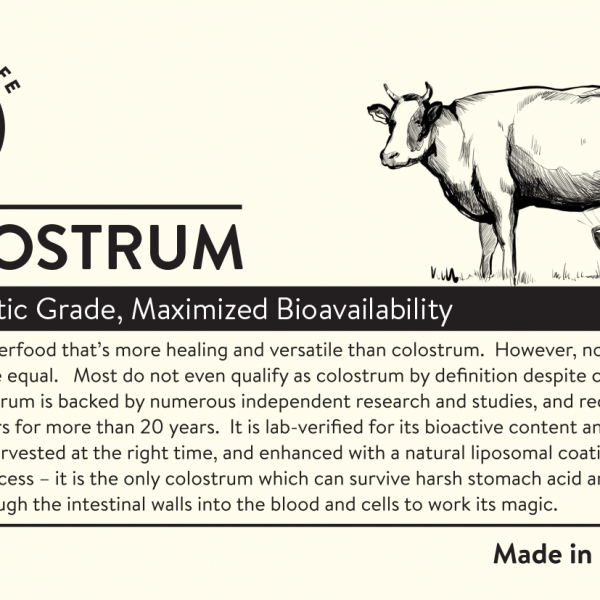 Our colostrum comes from cows which are all certified BST, BSE and antibiotic-free! Many people today have heard of colostrum, and we sometimes see colostrum sold alongside milk powders and infant formulas in tins. This is a huge injustice to colostrum as till date, there is absolutely nothing more complete and healing to the human body than true colostrum. 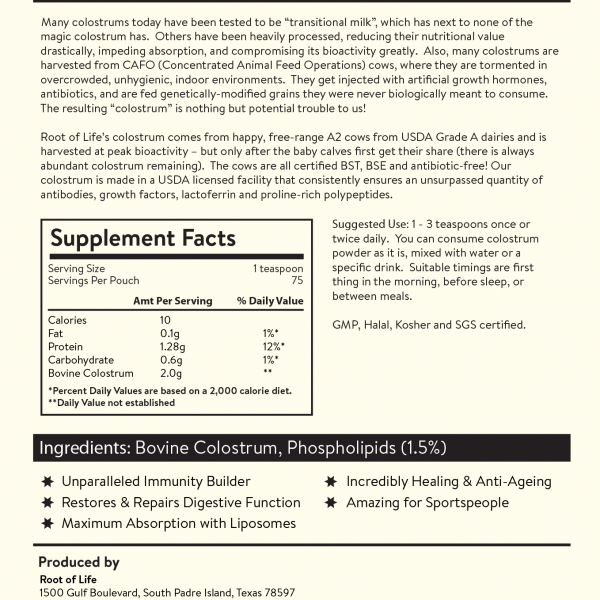 Colostrum is nature’s most effective and powerful superfood. It is also known as the “First Food of Life” for all mammals, since it is the “First Milk” produced by mammalian mothers. One might consider it a “jack of all trades” due to its wide spectrum of nutrition and versatility. However, we know for certainty that it is a “MASTER of all trades”. That is what all the staggering research and undeniable evidence is indicating. Why Most Colostrum May Not Be Effective? Not all colostrums are created equally. Many have actually been tested to be “transitional milk” or combinations of transitional milk and colostrum, yet they market their products as “colostrum”. What’s worse, these fake “colostrums” are defatted and agglomerated, reducing their nutritional value drastically, impeding absorption, and compromising its bioactivity greatly. Also, many colostrums are harvested from the standard cows that exist in large-scale factory-farming environments where they are treated in a very cruel manner, injecting these depressed, “mad cows” in overcrowded, unhygienic, indoor places with artificial growth hormones, antibiotics, and feed them genetically-modified grains which they were never biologically designed to consume. What happens is that they have absolutely no reasonable immunity, and their hormones are completely off whack. The resulting colostrum is nothing but potential trouble to us! Also, as a shelved and dried product, colostrum needs to be pasteurized to kill off any potential pathogens and undesirable bacteria. However, many large-scale farms pasteurize their colostrum at unbelievably high temperatures for a long time – where many of the bioactive and vital components in the colostrum will be completely denatured and destroyed – leaving behind a foreign end-product that is anything but healing, and anything but colostrum! When you consider that our colostrum has been backed by numerous independent research and studies, and recommended by practitioners for more than 20 years, you know are onto something very special – which may be the breakthrough answer for your health goals and challenges. The Source – Root of Life’s colostrum comes from USDA Grade A dairies from cows who are treated with respect, free to roam in the outdoors and grass-fed, and are of the rarer A2 variety – which are the ones that do not contain the mutated Casein that causes a whole host of problems. 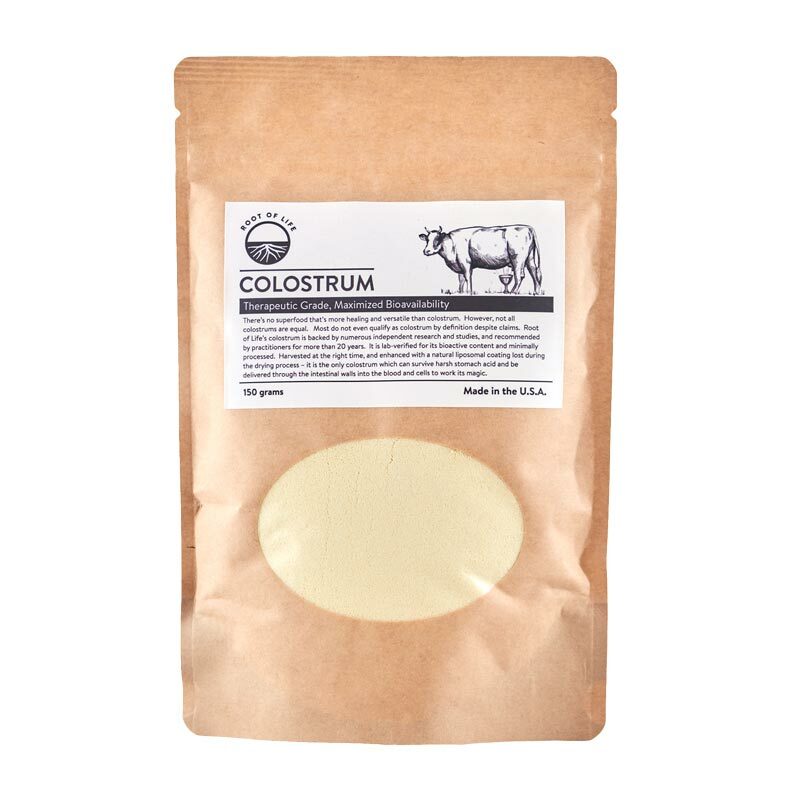 Our colostrum comes from cows which are all certified BST, BSE and antibiotic-free. Flash Pasteurisation – Unlike raw colostrum and raw milk which has to be consumed fresh or within a very short timeframe, all shelved and powdered colostrum meant to be kept for a much longer time requires pasteurisation by law. This is also important as unlike freshly produced raw milk, we do not want the bacteria present to be breeding and multiplying over time. Root of Life’s colostrum employs a gentle and super quick pasteurisation process of 8 seconds at a temperature high enough for the anti-microbial effect, but low enough to preserve all the critical healing and bioactive components in colostrum. Laboratory Verified – This is not just empty talk as every batch is verified by 3rd party, independent labs to ensure these components are still intact and bioactive. Quality Guarantee – Root of Life’s colostrum is made in a USDA licensed facility that consistently ensures a minimum quantity of antibodies, growth factors, lactoferrin and proline-rich polypeptides. The finished product is also GMP, Halal, Kosher and SGS certified. 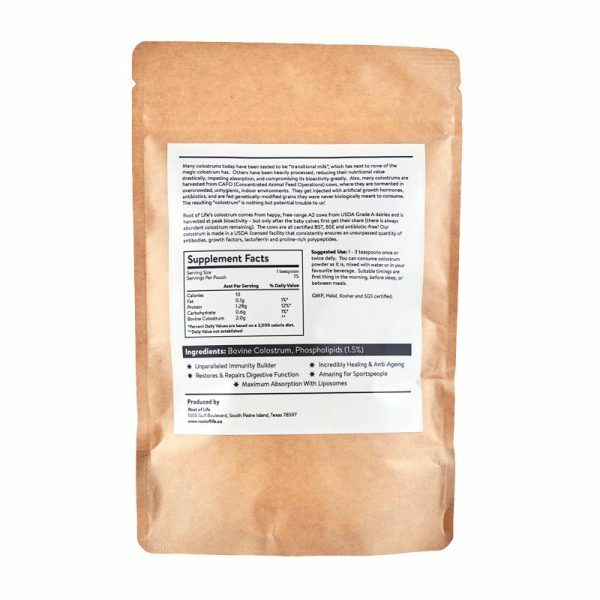 Multi-Spectrum – Unlike colostrum collected from single cows and farms, Root of Life’s colostrum is harvested from selected cows across farms where we get a whole spectrum of dynamic components into one finished, concentrated product. You thus get the immunity transfer and intelligence from multiple cows. Liposomal Enhancement – Root of Life’s colostrum mimics mother nature by employing a coating process with natural liposomes. These are lost during the air-drying and freezing process. Once done, it does not oxidize readily in storage, and is able to be delivered unscathed to the intestines, through intestinal walls into the blood and cells where the amazing array of nutrients, growth factors and immune factors are very much needed. This defining step is what makes our colostrum survive the harsh stomach acid environment versus regular colostrm. At the same time, some of the colostrum begins to heal the body once ingested from the mouth to the oesophagus, down to the GI tract, ensuring a whole body healing process. Directions: 1-2 teaspoons once or twice daily. Athletes and bodybuilders may take 2 tablespoons before activity and 1 tablespoon before sleep. People suffering from leaky gut syndrome may take 1 tablespoon upon rising and again before sleep. What Can Root of Life’s Colostrum Do For Us? Allergies – By “re-educating” the immune system with transfer factors, antibodies and more, allergies start to go away. Autoimmune Conditions – Similarly, as the immune system starts to get “educated and smarter”, it no longer goes on “automatic” mode to attack healthy cells and cause all sorts of tormenting problems. Anti-Ageing – When you introduce a boatload of growth factors apart from the famed ones like IGF-1 etc., the body is forced to regenerate and grow new cells and tissue, repairing DNA and RNA and activating stem cells. It is amazing as a face mask or applied topically to skin, cuts, burns, wounds – just try it on one half of your face using just water and colostrum as a thick paste and leave it on for 1-2 hours and wash it off to witness its miraculous effects! Digestive Health – Root of Life’s Colostrum is the surest way to overcome Leaky Gut Syndrome, and restore GI tract damage. Until this is done, all other digestive aids like probiotics and enzymes mean nothing. In fact, it helps to colonise good bacteria while eliminating bad bacteria in our gut. When we say restore damage, we are talking about re-growing and restoring damaged or lost stomach lining tissue, intestinal wall tissue and beyond – the benefits are astounding and continue to amaze us till this day. Diabetes – Our colostrum assists in weight loss, increases lean tissue mass, reduces cholesterol and triglycerides, detoxifies the body, restores metabolic function, increases insulin sensitivity, decreases blood sugar levels, regulates appetite and fat metabolism through leptin content – which all help with Type 2 Diabetes (Type 1 an auto-immune condition which is treated in a different manner than that mentioned above). Great for Stubborn Infections – Whether it’s a superbug, flu, virus, fungal or yeast infection, the antibodies, transfer factors, PRPs, and other synergistic support offered by our colostrum helps to keep infections at bay very impressively. 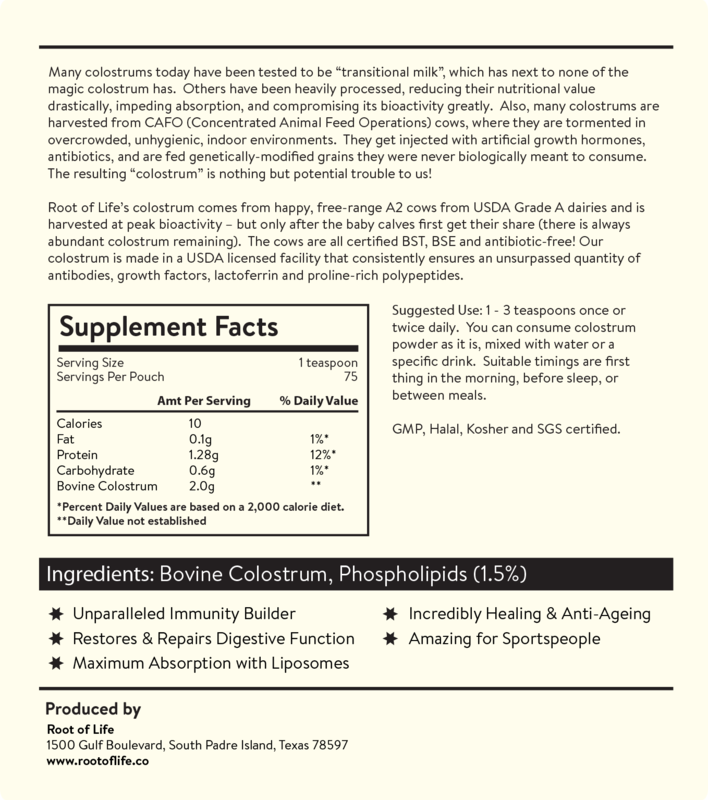 Works Wonders for All – Our colostrum has shown to transform not just the seniors, but athletes, infants, mammalian pets, nursing and post-pregnancy mothers!